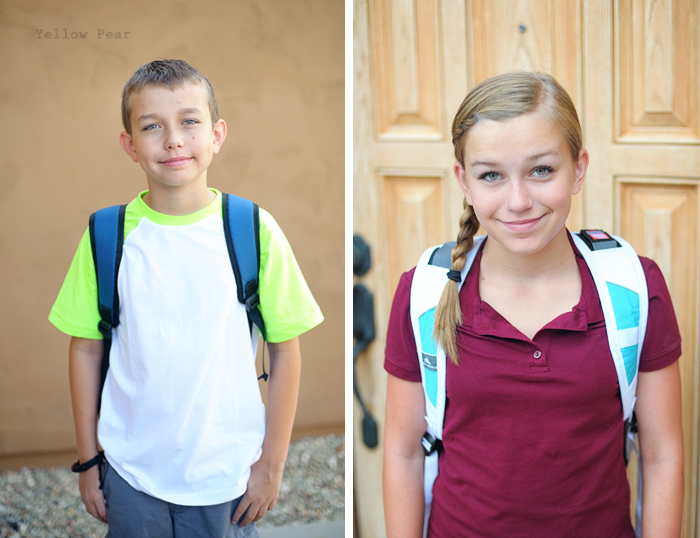 The kidlets started school on Monday. Seriously the summer flew by at warp speed. It seems to do that every year. 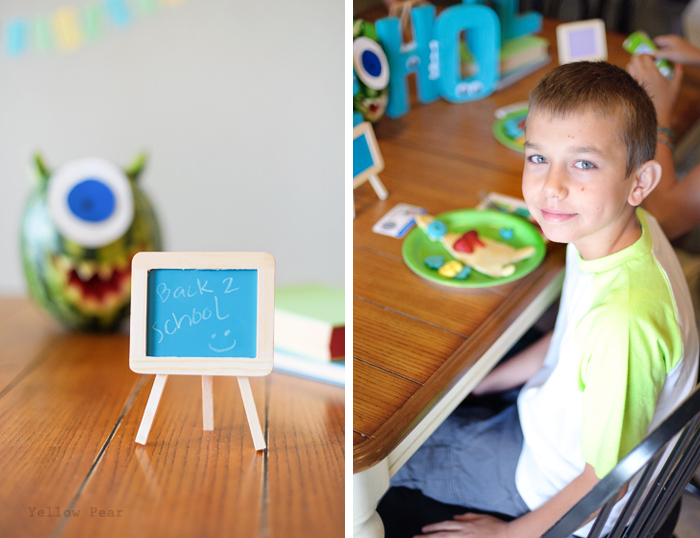 One of my favorite things to do for my kids is to decorate the breakfast table for special events. It is fun for them to wake up to a cheery surprise (even though by now they know something's coming), and it's a chance for me to delve into a theme...which we all know I love. Also, it's more low-key than a party and reduces the stress level to practically nothing (which I also love). 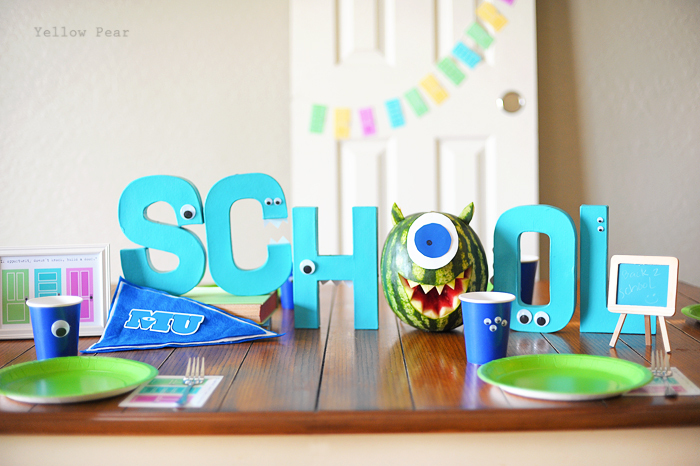 This year's Back To School Breakfast was based around the new Monsters University movie and the above quote. I saw some beautiful watermelon Mike Wazowskis on the web and just had to recreate the melon monster...and it wasn't too hard after all. Of course I'm not sure mine actually looks like Mike, but a monster for sure. And the kids thought it was fantastic, so that's what counts. 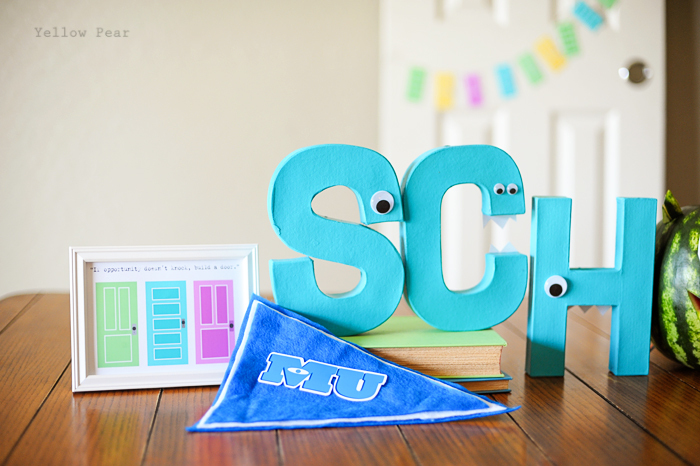 I reused my SCHOOL letters from last year, spray painted them turquoise and added googly eyes and teeth. 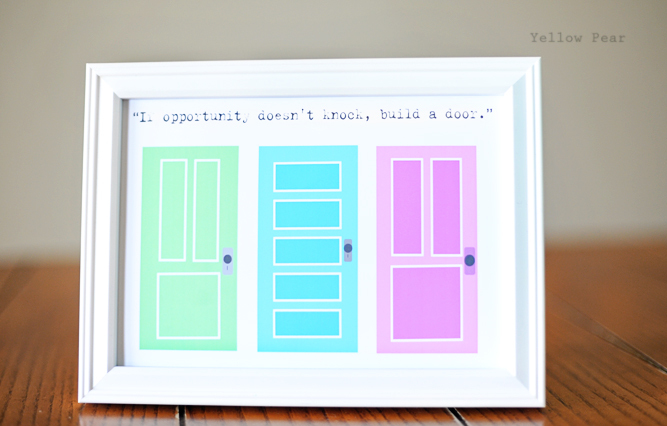 I brought down one of Miss B's closet doors that was chilling against a wall in her room as it is CONTINUOUSLY falling off the tracks and wreaking havoc in our lives (I have resolved to add curtains to her closet instead). 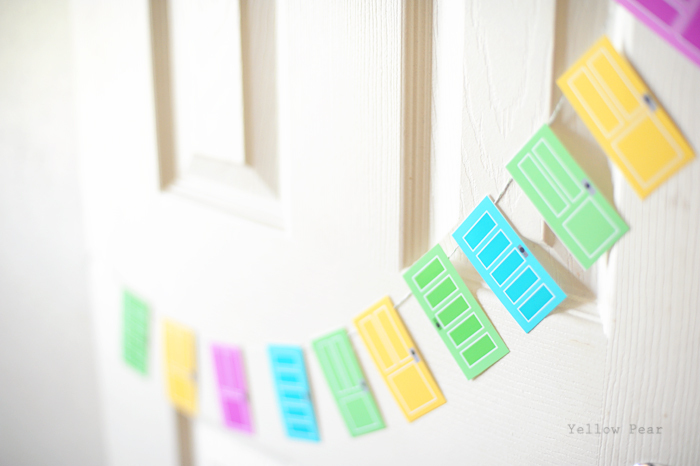 I also made some colorful little doors in Photoshop and created MU Student Id's for each new student here. 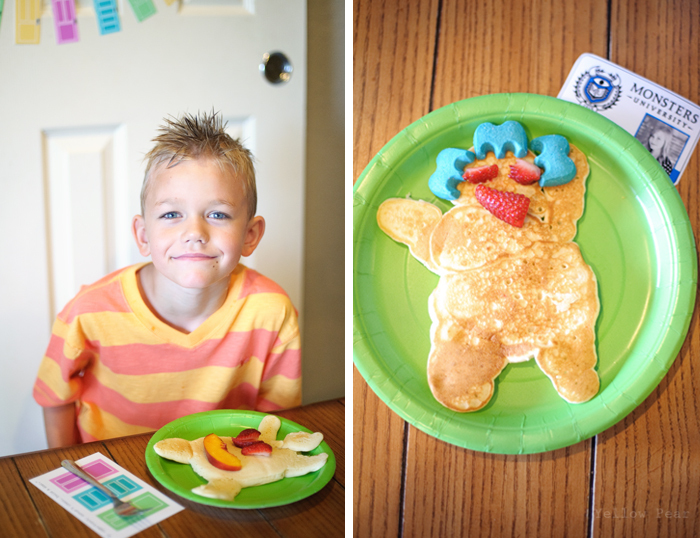 Dad whipped up some awesome monster pancakes and the kiddies personalized them with cookies and fruit. Then we rushed off to meet the day. Miss B was already gone (she started a new school this year that requires uniforms and an earlier start time) and so she wasn't in the group shot. 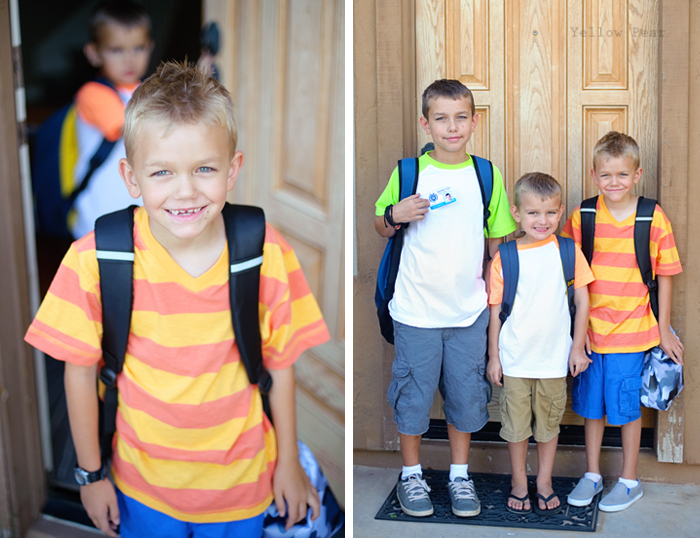 Q will start preschool next week and is packing school supplies daily. He has a binder, notebook, paper, various and assorted erasers, pencils, three rulers and his ID card. I think he's completely prepared. And just like that they started a new year. 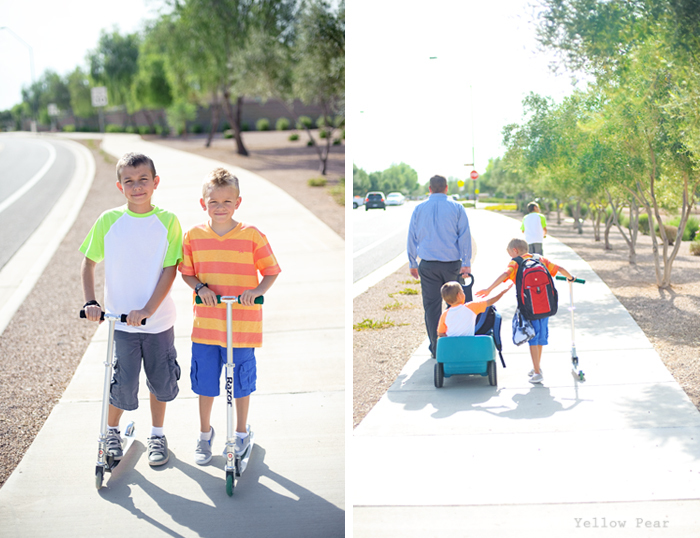 May they make good friends, listen to their teachers and love to do homework.